Technically, this is a week of vacation for me. Working from the home and now as a "private contractor" (or maybe I should say and coin the term: private culinary contractor?) at a small area cafe should afford me ample time to feel refreshed and rejuvenated. After all, with such a flexible schedule, I should be able to slip off for a walk or a nap as I please, shouldn't I? But so often that isn't the case, especially now in the heat-soaked Summer with school out and a busy new 6 year old to keep entertained. I usually try and make the 180-mile journey to my Parents farm more often than I have since gas prices have spiked. I like to drive it without stopping in part because it's only a little more than 3 hours, but also in part because it reminds me of the days when I drove incessantly. Gas was around $1/gallon, and I remember one year logging more than 25k on my Buick. Now when I stop the engine and step out onto the dry, gravel driveway the thing that strikes me first is just how absolutely quiet it is. I don't live in the biggest or loudest city, but city is city and country is country. Country makes me breathe in deep, immediately calm down and think more clearly. Country is what feels like home. home always has something with poppyseeds in it too. My mom has been experimenting with eating much less sugar and gluten. In attempt to alleviate some symptoms in a persistent health issue, she noticed that she felt better, had more energy and even was sleeping a little better when she cut way back on those two components of her diet: two components that we usually eat far more of when we're together. Before leaving my city home, I mixed up a big batch of gluten-free all purpose flour mix using some on-hand flours and starches. (I used this recipe base, substituting teff, quinoa, and millet flours for the sweet rice flour. Shauna also has a more recent post here with a great explanation of GF flours and starches and how to combine them for GF ap flour.) I had just read a recipe by one of my favorite (local) GF bakers Annie Wegner-LeFort called Alabama Bread, and I couldn't wait to bake one up. I had some blueberries and my Mom had some raspberries, and this bread took no time to make its way from bowl to parchment lined loaf pan. 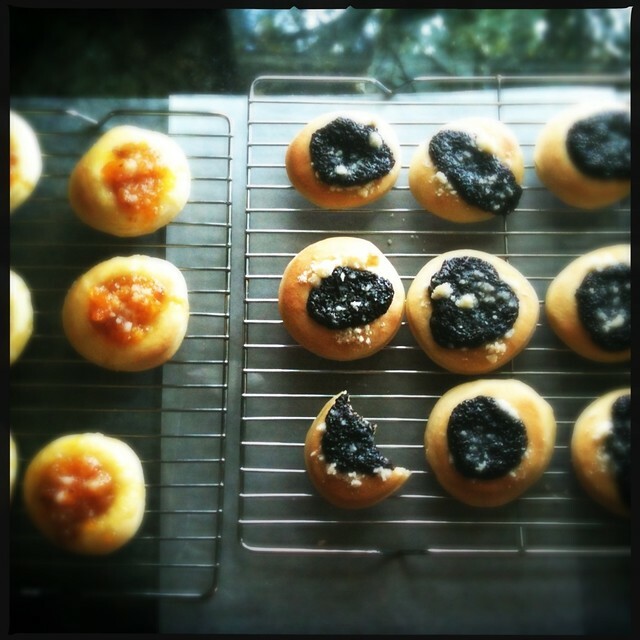 Gluten-free baking is something I will be excited about for a while. I love the textures and contrasts of alternative flours, and there is never a fear of overmixing. I haven't figured it out completely, but I now understand a little more about the structure of gluten-free bread. I think it's better to bake in a "taller" pan, helping the loaf rise a bit more than it might without the extra inch or so. My Mom has 4 inch by 10 inch loaf pan that worked perfectly. I'd like to invest in a duo of those pans, they make a perfect "tea loaf" slices that aren't too big. 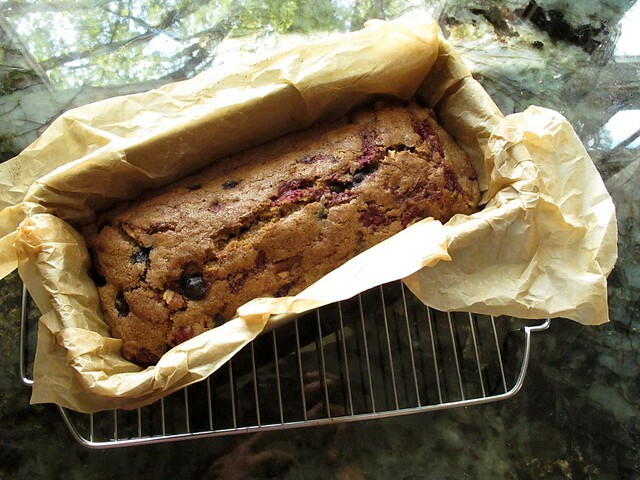 I lined my pan with parchment so I didn't need to worry about getting the loaf out, and I think every extra caution is worth it when working with gluten-free baked goods. 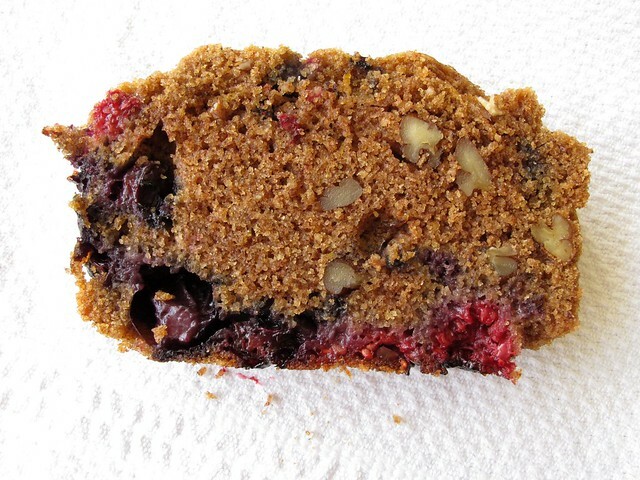 From the little research I tried to find on "Alabama Blueberry Bread", I found that it is usually a bread that gracefully bridges the gap between loaf and cake. 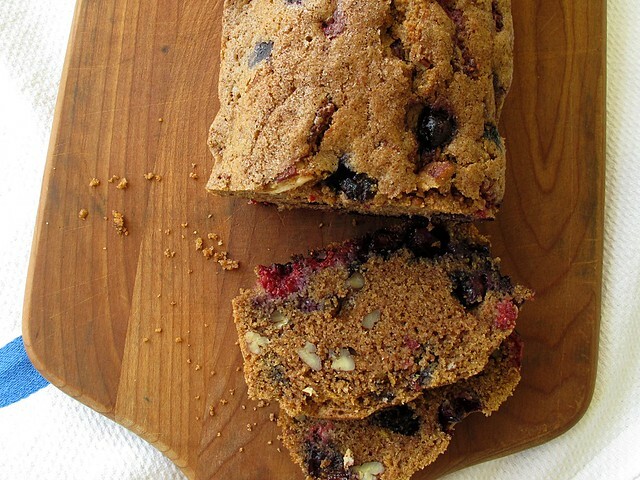 "Breakfast Bread" is how Dorie Greenspan would probably define it: the bread that you can convince yourself is healthy enough to begin your day with, one very comfortable with a cup of coffee alongside. I wondered if blueberries are actually native to the south, and I found that Southerners probably would use Rabbiteye blueberries. The article I read also noted (interestingly) that "as increasing numbers of Northerners move south, the demand for blueberries will increase." Perhaps even more southern is is the ample addition of pecans, which I prefer to stand over the bowl and crumble in by hand instead of chopping. There is something calmly therapeutic about crumbling a pecan by hand. If you keep a shaker of cinnamon sugar at the ready for toast as I do, you can use it to sprinkle the bottom of the pan before adding the batter and also dusting the top prior to baking. It makes for a nice, gently crisp, sugar topping. Preheat the oven to 350, and crumple a piece of parchment paper to crease it thoroughly then line a 10x4 loaf pan with it. 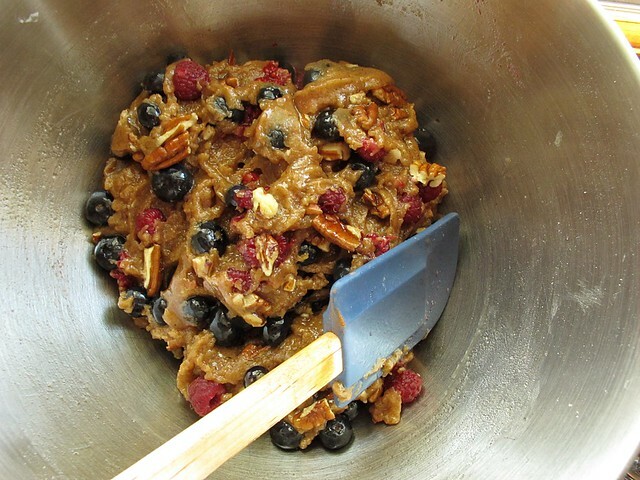 Once the batter is well mixed, fold in berries and pecans to distribute evenly. 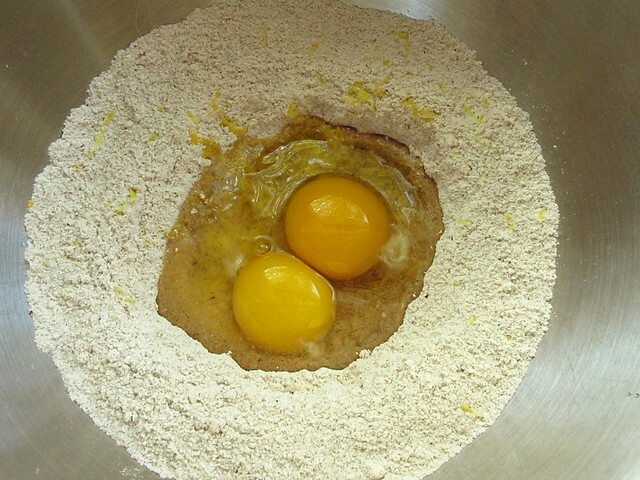 Spread the batter into the prepared pan and smooth the top. Sprinkle the top with cinnamon sugar, and bake for about 1 hour until a tester comes out clean. Try to wait until cool to slice, but that will probably be impossible. Apparently, the loaf should store well in the fridge for several days at least - but I'm not sure I'll ever be able to let you know if that is accurate. There is also a reason that nearly every recipe I perused made two loaves instead of one. We polished up 3/4 of the loaf before the end of the day. Next time, I will definitely make two. The last of the loaf will go today for sure - 24 short hours after coming out of the oven, and 24 hours less until I have to leave the country again for a while. Meanwhile I'm soaking up the quiet life, enjoying the first of the rain I've seen in more than a month, and enjoying the final days of my sugar binge. Happily, at least some of my sugar consumption is gluten-free!